This is a funky view of Montrichard, a town about twenty minutes away from our house on the other side of the river. 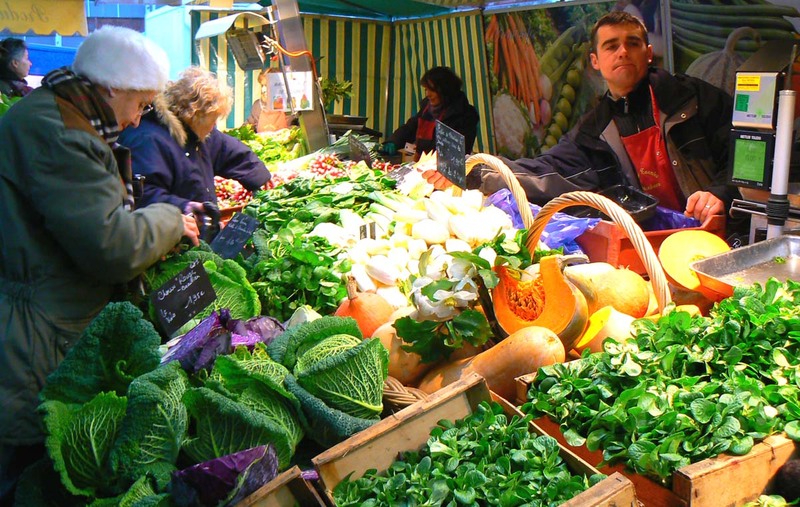 They have a great market on Friday mornings. 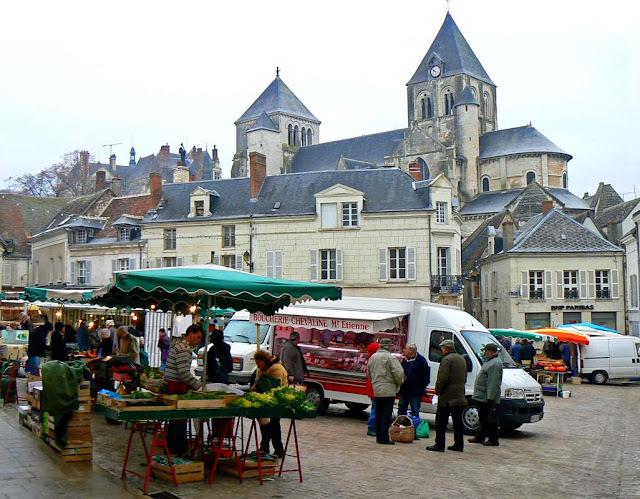 Many of the vendors that sell at Saint-Aignan on Saturday are also in Montrichard on Friday so we don't often go for the market. But there are other vendors we don't see closer to home and it's nice to go every now and then. A view of the château ruins at Montrichard on Christmas Eve, 2010. I call this a funky view because the town is much more picturesque when seen from other angles. 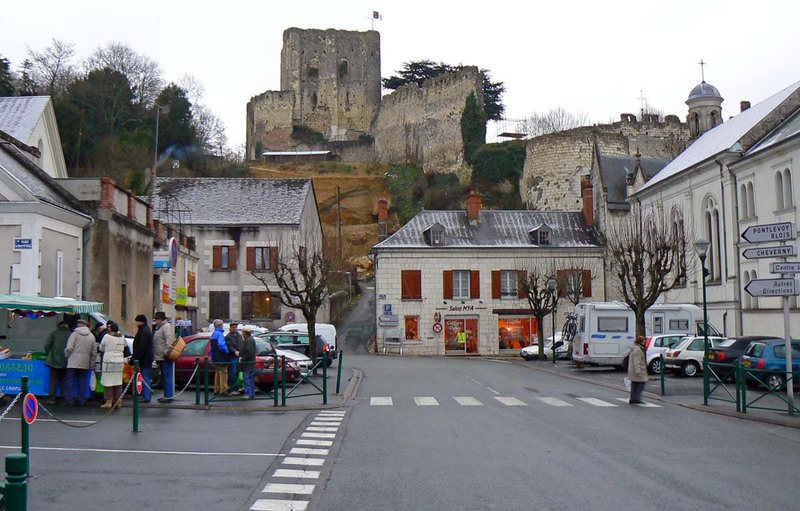 Montrichard is built at the foot of an old château, the donjon and ramparts being all that remain of it. There is also a nice church and a pretty lively main street that parallels the river. The real estate agent we worked with to buy our house has an office here, and our bank is here as well. Directly across the river from town, next to a small faubourg aptly named Le Bout du Pont (The End of the Bridge), is a campground with a big sandy beach. The Cher is very pretty as it glides past Montrichard. When the weather gets better I'd like to go over and do a decent photo shoot of the place. Combine that with market shopping and/or lunch, and we could make a day of it! By the way (and for all you language nerds out there), the "t" in Montrichard is pronounced. 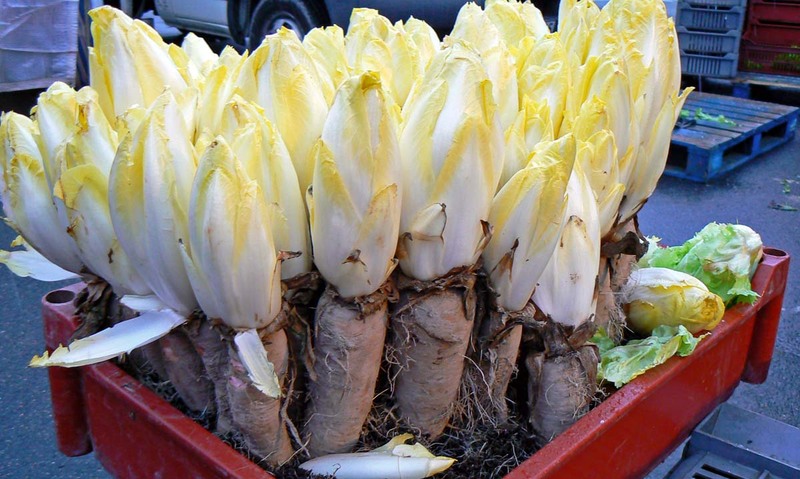 Endives, what we Americans sometimes refer to as Belgian endive and the Belgians call chicon and witloof, is a type of chicory cultivated for its edible white leaf sprouts. We eat them all the time either raw as a salad or cooked, often wrapped in a slice of ham and gratinées in a béchamel sauce. They're always sold in the markets and supermarkets in France and they're pretty common, so not particularly expensive. Endives and their roots at the market in Montrichard, 24 December 2010. At the Montrichard Christmas eve market, I saw something I had never seen before. The vendors had many endives on display for sale to customers, all neatly trimmed and without roots attached. But off to the side, away from the beautiful displays, I saw this bin full of endives still attached to their roots. I suspect this is how they're transported to market to ensure that they stay fresh and don't wilt prior to sale. These roots are planted in a rich soil mixture in a dark place. When the leaves begin to grow, they have no light to photosynthesize, so they stay white. The young buds are cut and sold before they get any bigger than five or six inches long. What I don't know is if they re-plant those roots for another crop. There are still a few pictures from the Christmas Eve market that I wanted to share, mostly from that produce stand where we bought our sprouts. As I said before, everything looked so good that we ended up buying more than we had planned. 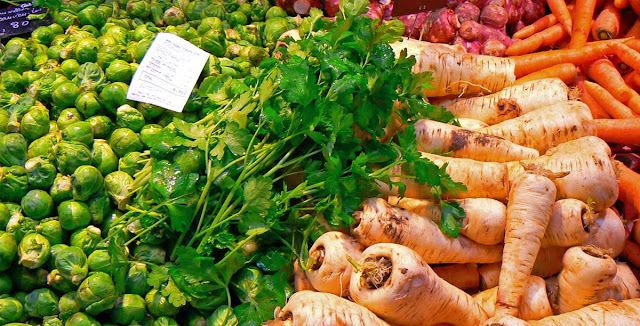 Choux de Bruxelles (Brussels sprouts) on the left, panais (parsnips) on the right. In addition to the sprouts and a bunch of celery, we got some topinambours (jerusalem artichokes). They were big and round and good looking and the price was not high, so we got some. We still haven't eaten them, but they're fine in the fridge for a while. They are actually the root of a particular sunflower and they're very tasty eaten like potatoes, whole or pureed. Topinambours (top left), parsnips, carrots, and celery. There were also some gorgeous carrots and panais (parsnips). We resisted those because we already had carrots at home and couldn't think when we'd eat the parsnips. We both like parsnips so we'll go back and get some another time. One interesting thing I noticed in the picture is that the little price signs say that the vegetables (the topinambours and panais, at least) were harvested in Beaulieu-lès-Loches, a town that's about forty minutes south of us. Real local food. That's Valencia, Spain. On the weekend before Christmas, Ken and I were invited to some friends' house for Sunday lunch. 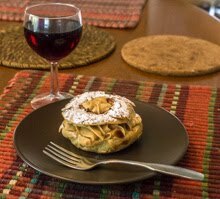 Our hosts made a terrific meal with a Spanish theme as a kind of counterpoint to all of the French goodies we would be eating during the holiday week. Everything they made was delicious. For dessert, they served a cake infused with the essence of oranges. My version of the cake soaking up its imbibing liquid. That's Triple Sec orange liqueur in back. The cake was richly dense, imbibed with orange flavor, and topped with a thick and sticky orange glaze. It was a very sensual cake and perfect for the winter holidays when oranges from Spain and North Africa are in season. Naturally, I asked for the recipe and decided to try it out myself for Christmas day. It turned out very nice and I'm encouraged to try it again. 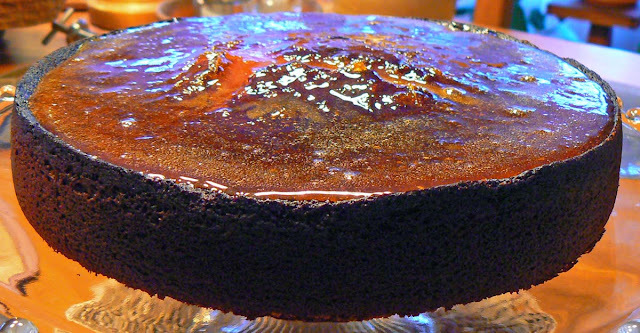 The finished cake topped with orange caramel glaze. 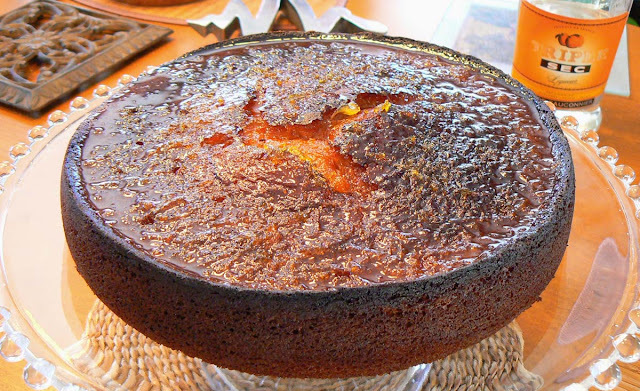 The cake's intense orange flavor comes from the combination of orange juice, orange zest, orange liqueur, and sugar which is reduced and poured onto the cake and allowed to soak in over several hours. The glaze is the same mixture, reduced even further to a near caramel stage before being spread on top. *****UPDATE: A few of you asked for the recipe, so here it is. Add the sifted flour mixture a little at a time to wet ingredients until well blended. Pour batter into an 8” cake pan that has been buttered and dusted with flour and sugar. Bake in a pre-heated 375º oven for 30-45 minutes or until an inserted wooden skewer comes out clean. Turn the oven down to 350º halfway through the baking if it seems to be going too fast. Cool on a wire rack. Heat in a sauce pan and simmer for approximately 30 minutes. Using a wooden skewer, poke holes in the cooled cake. Pour HALF the sauce onto to cake to imbibe it. You can thin the sauce with a little more liqueur if you like. Allow it to imbibe for at least an hour. For the final glaze, simmer the remaining half of the sauce until it reduces to a few tablespoons. Spread it on the cake with a spatula. Decorate with strips of fresh orange zest if desired. When I was around twenty years old and buying Christmas cards, there was a line of humorous cards that one of the big card makers sold. I saw one that featured a picture of a product called "tater tots," those frozen deep-fried balls of mashed potatoes that you heated up in the oven. The little tater tots had human eyes drawn on them. The card read, "Tater tots with their eyes all aglow." It made me laugh out loud (even though lol'ing didn't yet exist). I'm a sucker for a corny joke or pun. The sillier it is, the more I like it. Simple minded, I suppose. I've never forgotten that card and now I wish I had bought one and saved it. Little did I know back then that "tater tots" are actually the fast-food version of a French classic: pommes dauphine. I saw one of the Cuisine TV hosts make them a few weeks ago and decided I would try them out for our Christmas dinner. They're not difficult to make, but after making them I understand why they come frozen and ready to pop into the oven. First you have to peel, boil, and mash about a pound of potatoes. Then you make a pâte à choux (puff paste) by melting 100 g of butter in 1/4 liter of salted water. When it comes to the boil, add (all at once) 200 g of flour and stir it in with a wooden spoon. Once it's well blended and forming a thin skin on the pan, remove it from the heat and add four eggs, one at a time, stirring each in completely before adding the next. When this is done, add the mashed potatoes and mix thoroughly. Heat up some oil for deep-frying, then form the potato mixture into little balls or quenelles using two spoons. Fry them until they're golden brown, drain on paper towels, and serve warm. I made about twenty with two thirds of the dough. I'm going to freeze the remaining dough and make more another time. Of course, for just the two of us, twenty tots were far too many, so we had some left over. I just heated them up in the oven the next day. As is Ken's and my tradition, we made a cheese fondue on Christmas Eve. This year, however, it was a bit different in that we used cheeses not normally used in a fondue. Ken found a recipe for a fondue du Mont-Dore, a ski resort town in the Massif Central. The traditional fondue Suisse (Swiss fondue) is made with Gruyère and Emmenthal; both are cheeses made in Switzerland. 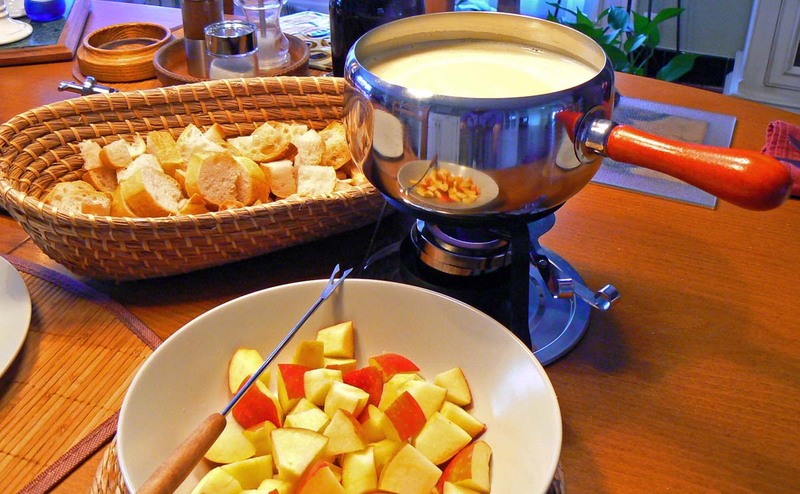 In France, the traditional fondue Savoyarde (fondue of the Savoie and Haute Savoie) is made with similar French cheeses and usually includes Comté. Our cheese fondue served with French bread and chunks of apple. There are other fondues in that area, each made principally with its own local cheese. The fondue we made this year used cheeses from the Auvergne region in the mountains of the Massif Central. It could just as well have been called fondue Auvergnate. It's made with the local cantal and St.-Nectaire cheeses, both of which we really like. If you haven't already seen it, Ken posted about these cheeses here. Since the cheeses come from the Massif Central, I decided we should call ours une fondue massive. A little play on words there. It was good, but not as good as a good Alpine fondue; the cheese was very mild once it had melted and not all that flavorful. We ended up grating some Comté into it after we started eating to give it some of that sharpness and nuttiness that we like in a fondue. That worked well and we were not disappointed. Whatever Christmas is to you, I hope you enjoy it. Ken and I are home doing one of the things we enjoy most: cooking! 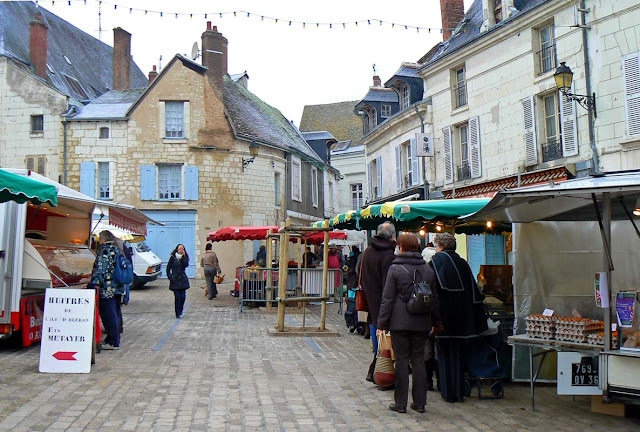 On Friday we went to the market in Montrichard (about twenty minutes from here) to pick up the turkey we ordered. Luckily, the weather was not as bad as predicted and we had no trouble driving over. We even had terrific parking karma. The produce stand where we got sprouts and other good things. We got the turkey and some chicken livers, some sprouts, some celery, some topinambours (Jerusalem artichokes), some salad, and some bread. Then we went and got some wine for the weekend. The market was not too crowded yet (we got there early) and a light snow started to fall while we shopped. It was very pretty and quite festive as everybody we encountered was in a good mood. Oh, and I'm trying something new this year. It's called pommes dauphines. It's French for, well, 'tater tots. With their eyes all aglow. It's potatoes in a purée, mixed with a pâte à choux pastry, then deep fried in oil. If they turn out ok, I'll try to remember to take pictures. I'm making them from scratch and not buying them from the freezer section. Just sayin'. Here's hoping your day is beautiful and delicious! We're heading out to the market this morning to pick up the turkey we ordered two weeks ago. The weather is supposed to be pretty crappy, so wish us luck. Also on the shopping list are some brussels sprouts and some wine. Since it's Christmas Eve, we'll have our traditional cheese fondue meal today. The turkey is for Christmas Day. Our Christmas turkey breast from 2003. We're doing something similar this year. We plan to roast the turkey breast on a pile of stuffing. 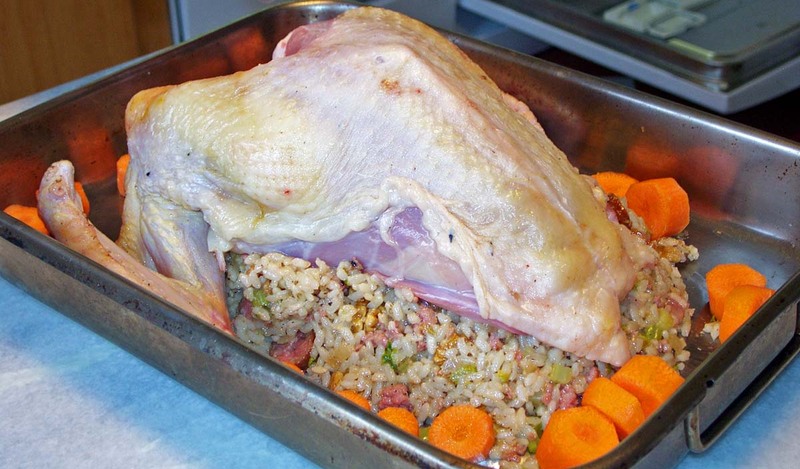 The photo above is the turkey (without its legs) we cooked in 2003, our first year in this house. The stuffing was made with rice; this year's will be made with cornbread. But you get the idea. The legs will be removed and made into confit (slow-cooked in duck fat), to be eaten later. As they say in France: Bonnes fêtes de fin d'année ! et Bon réveillon ! My astronomical birthday yesterday was great fun! I call it astronomical this year because in addition to the solstice, the universe gave me a full moon and a lunar eclipse to celebrate. Unfortunately, the skies were overcast and rainy, so I didn't get to enjoy them until I watched the news. I didn't take any pictures this year; these steaks are from last year's birthday dinner. Ken and I spent the morning shopping. We had to get new tires on the car to pass the bi-annual inspection this year, so we took advantage of the wait time to hit the hardware store, the home decoration store, and the grocery store, all within a five-minute walk of the garage. Lunch was the traditional steak au poivre. That's the meal I had on my birthday while in Nice, France, back in 1981. I've had the same meal on my birthday every year since then. 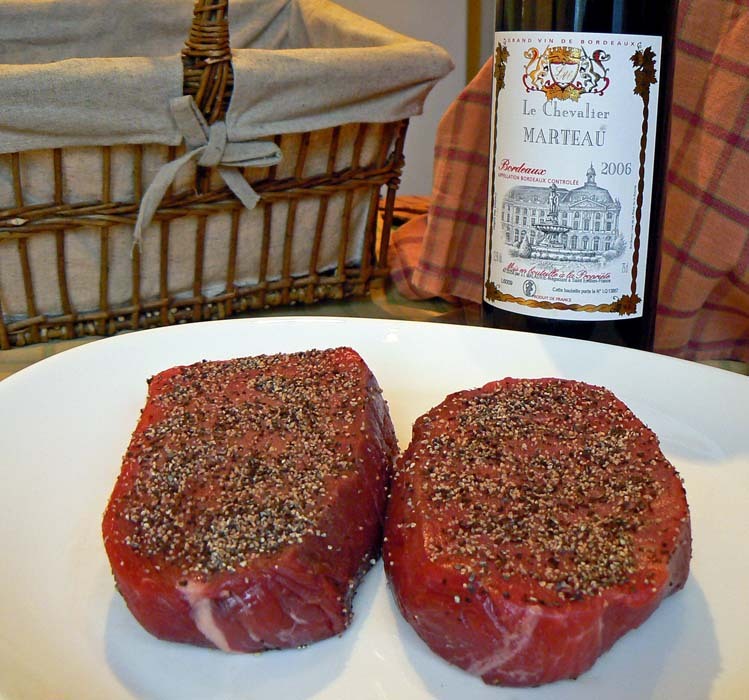 When we made the dish back in the US, we'd often use a cut from the tenderloin, either filet, tournedos, or chateaubriand. Here in France the usual steak for the dish is rumsteak, a very lean and tender cut, which is what we got. I crushed a bunch of black peppercorns with the mortar and pestle and coated the steaks with it. They sat for about an hour like that. Then we seared the steaks in a hot pan and set them on a platter to rest under foil. The pan was de-glazed with armagnac and the sauce made with a little beef bouillon and cream. And more armagnac. We served the steaks with French fries, as is our tradition. The steaks were perfectly done: crusty on the outside and very rare inside. Pure heaven on a plate! By the way, Ken's photos of this year's meal are here. 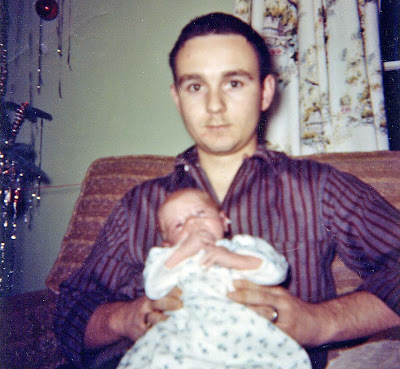 Here's my twenty-one year old dad holding me shortly after my mom and I came home from the hospital. It's one of a small collection of polaroids that I have tucked away in a box. I've scanned most of them and have worked to improve some of the images. Photoshop does wonders for old faded photos. I have no idea what house or apartment my parents lived in when I was born; they didn't live there long because they moved shortly after. I don't even know where this picture was taken. If you look closely, you can see my dad's wedding ring. I still have that. It's a strange thing to have, but there you go. I got a nice Christmas card from my aunt (on my father's side) the other day. 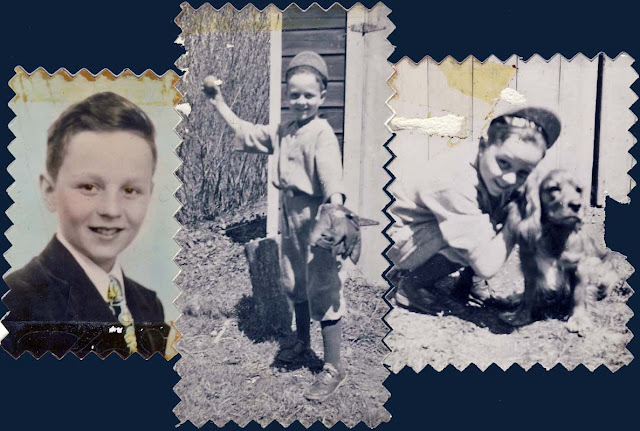 She enclosed some old photographs of my dad from when he was a kid. Judging from his age in the photos, these were likely made sometime in the mid to late 1940s. The portrait on the left says "49" on the back so I assume it was made in 1949. No mistaking my dad with his high forehead. The dog's name was Ginger. She wrote that the photos belonged to her aunt and that a cousin sent them to her recently. I'm sure I've never seen them before. Except for these now, the oldest pictures I have of my dad are from his wedding a little over two years before I was born. He died very young in 1982. Well, almost. Ken got a solicitation for a donation to a group that trains guide dogs for the blind. In with all the literature they sent was this little stuffed guide dog. Callie is fascinated by anything that's soft and stuffed with fluff. Anyone who's given her une peluche (a stuffed toy) knows that within five minutes she's got it torn open with the fluff strewn over the floor. We warn friends that this will happen so they're not shocked. When I set up the little stuffed dog to take it's picture Callie was extremely curious. 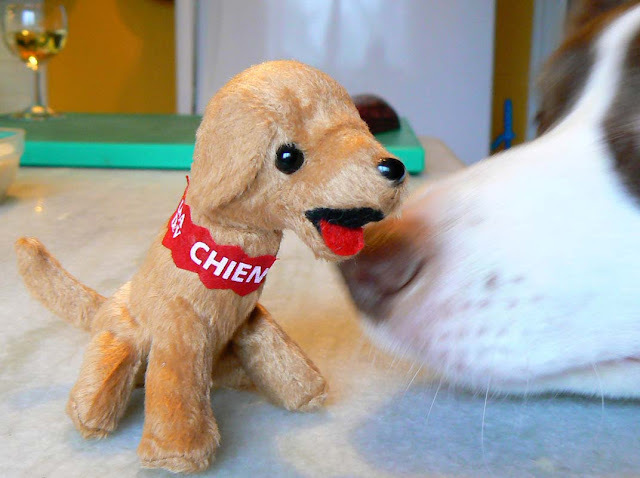 You can see her snout sniffing the new arrival in the photo. Once the picture taking was done, Callie got to play with her new "friend." After a few minutes, well, it wasn't pretty. No junk mail. That's the essence of this simple sticker on a mailbox in Saint-Aignan. It's part of a campaign to reduce junk mail. Residents around the nation can request stickers for their mailboxes from a number of ecological associations dedicated to reducing waste from junk advertising. Curtains twitched across the street when I stopped to take this picture. We don't get much junk mail here in France compared to what we used to get in San Francisco. But there is some (You may already be a winner!). 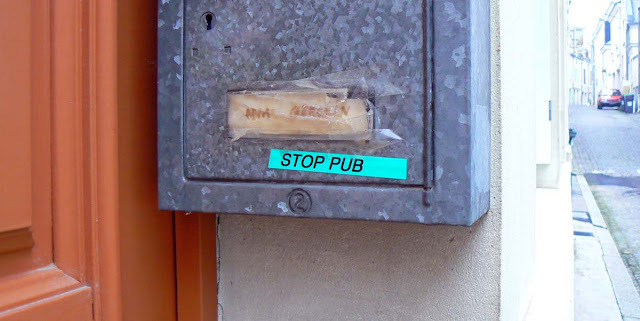 Since the local supermarket flyers make up most of the junk mail we receive, and we actually want to get those, we haven't thought about putting a stop pub sticker on our mailbox. In case you are wondering, pub is short for la publicité, which is the French word for commercial advertising. 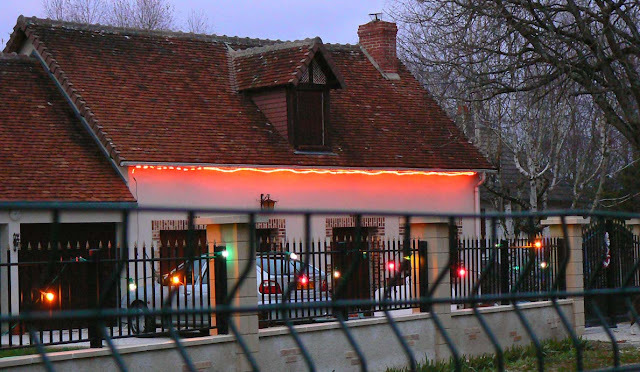 On Wednesday I got the sudden urge to put lights up on the house. I've never done it here before because, up until recently, there was no electrical outlet on the outside of the house. We had one installed on the deck this past summer. So I took a string of white lights and wrapped them around the deck railing. If you look closely, you can see the lights on the deck railing. Click to entwinkelate. Then I took the camera out at dusk to see if I could get a decent photo. Out of the ten or so photos I took just after sunset, the one above turned out best. It's a very subtle look. I'm not comfortable enough with my ladder skills to get lights up along the roof line (two floors above the ground). And besides, with the lights strung on the deck railing, I can see them from inside the house. Are you tired of market pictures, yet? I took this one from the southeastern corner of the market square, looking north toward the collégiale church and the château. I kept looking at it, thinking that it didn't quite look right. Something was different. The newly renovated market square is missing a familiar sight: the high-pitched roofs of the old présidial. Then I think I figured out what it was. The large roof of the old présidial is missing (see what it looked like here). It should be visible just to the left of the smaller church tower, blocking the view of the château's roof line. It's been torn down. That's not surprising, given that the roof had huge gashes in it and looked like it might collapse any time. Within the past year, a large scaffolding was erected around the giant roof, and I thought that repairs were under way. But it seems that demolition was the goal. I have no information about whether the demolition is temporary or permanent. Did they remove the old broken roof and build something more modest to save the building? Are there plans to rebuild the roof as it once was? Who knows? I'll have to talk to my friends who live in town and see what they know. We live outside the town limits in another jurisdiction, so we don't get any newsletters or other official information about what goes on in Saint-Aignan proper. It would be a shame to permanently lose that old roof; it was a distinctive part of the town's skyline. On the other hand, renovations cost money and saving the building and making it usable (not to mention safer) might be more realistic in this case than preserving the skyline. I know, being a city planner, that you can't save everything. Sometimes photographs and memories have to suffice. And, actually, the view is much better this way. Before the market square was renovated, there were posts here and there with electrical outlets on them. Vendors used them to get electricity for their refrigerators, lights, and other appliances. When the square was renovated, those outlet posts were removed. One of the poultry vendors at the St.-Aignan market tending to his roasting chickens. What replaced them are these underground outlets (you can see one in the bottom center of the photo above). When they're closed up, they look just like the other cobble stones around them. On market day, they're opened up and a big electrical hookup pops out. Pretty cool, eh? This is one of the poultry vendors at our market. It's not the one we normally go to. But he has these two big rotisseries going every Saturday. The rotation is powered by electricity and bottled gas provides the flames for cooking. Chickens roast all morning on the spits and are sold to customers who want an already cooked bird. As the chickens turn on the spits, their juices drip down into a tray at the bottom of the rotisserie that is filled with small peeled potatoes. The cooked potatoes are sold along with the chickens. Yum! 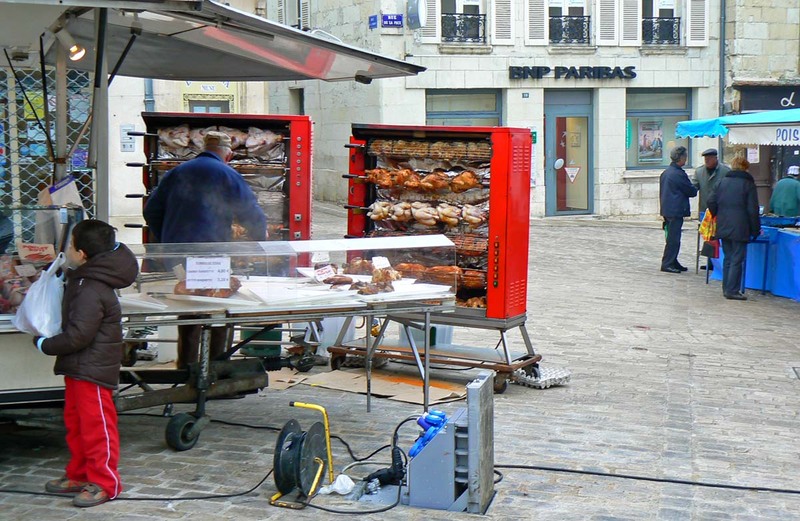 Since the market square is built on a slope, this vendor uses a few egg cartons to steady his rotisseries on the cobblestones. You can see a corner of the fish monger's stand to the right in the photo. The central square in Saint-Aignan was renovated last summer. Mostly what they did was take out the old trees, tear up the asphalt, and rebuild the water, sewer, and electric lines. 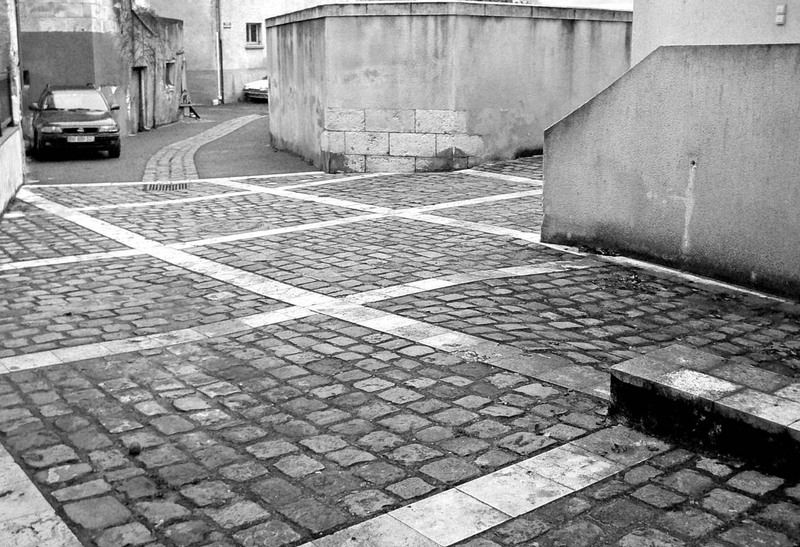 Then, of course, they re-paved the square in old-fashioned cobbles. When they finished, the square felt very bare. 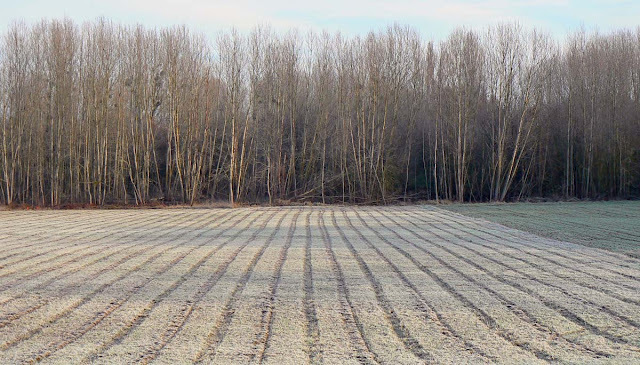 The planned new trees would not be planted until the fall. Two of the new trees in the market square. They're barely visible in the center of the image. Well, now the new trees are in. They are very young trees, barely taller than a man, and it will be a few years before they even begin to cast some shade in summer. All together there are seven trees in the square. I'm not sure what species they are, but once they leaf out this spring I should be able to tell. It's strange when these renovations are done. I'm used to France seeming so old, with huge old trees lining the avenues and shading the public squares. I forget that all those old-looking places were new once, that they've likely been renovated once or twice over the centuries, and with young trees. I suppose I'm fortunate to see what the square looks like "as new." The shock of the bare and new will wear off over time, to be sure. In twenty years, it might look old again. I don't think I've ever bought cheese from this vendor. We buy most of our goat cheese from a producer whose farm is close to our house. He sells his cheese at the farm and also has a stand on the other side of the market square. But his stand is just a table. This vendor has a nifty trailer. 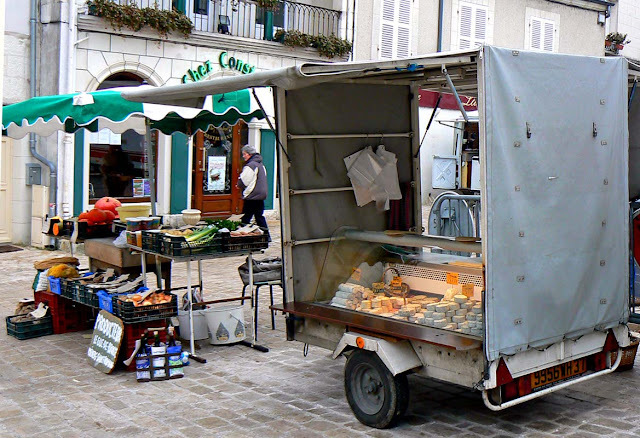 A trailer full of goat cheeses next to a stand of local produce at the St-Aignan Saturday market. We live at the intersection of three A.O.C. goat cheese regions, each with its distinctive shape for the cheese: Selles-sur-Cher (disk shaped), Valençay (pyramid shaped), and Sainte-Maure-de-Touraine (log shaped with a straw in the middle). 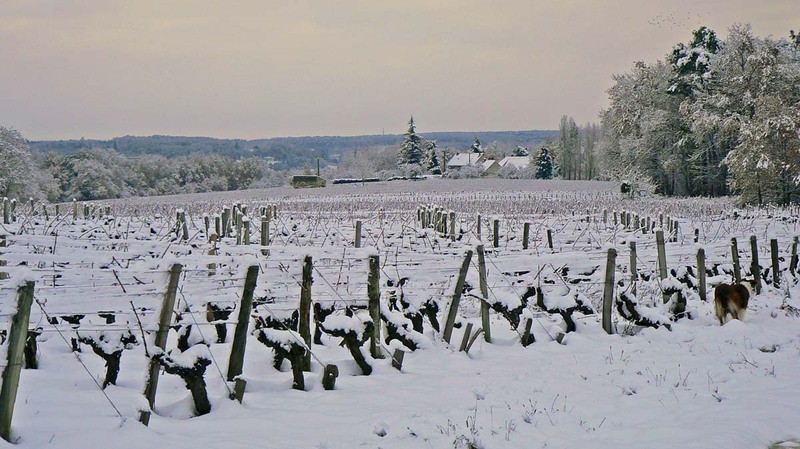 We're also close to the Chavignol and Pouligny cheese regions. There is a lot of goat cheese at all the markets around us. Our little market here in Saint-Aignan has at least three different goat cheese vendors that I can think of. In my experience, there isn't much of a flavor difference among these goat cheeses. But each cheese is available in a range of ripeness from "fresh" to "very dry." That's where the flavor differences lie. Ken and I went to the market on Saturday. We wanted to order a bird for our Christmas dinner. We weren't sure what kind of bird we wanted. We had narrowed it down to two: une pintade (a guinea fowl) or une dinde (a turkey). It all depended on the sizes available and the cost per kilo. On the left, a capon. On the right, a goose. The heads are left on so you know what you're buying. What we knew beforehand, however, was that we wanted to order our bird from the volailler we've come to know and trust at the Saturday market: Chez Malbran. So we lined up and asked the appropriate questions. The turkey was about seven and a half euros a kilo. That was my upper limit for turkey, since guinea fowl was five euros twenty per kilo. The woman at the counter said we could get a small turkey, between three and four kilos. That was fine, so we ordered one. 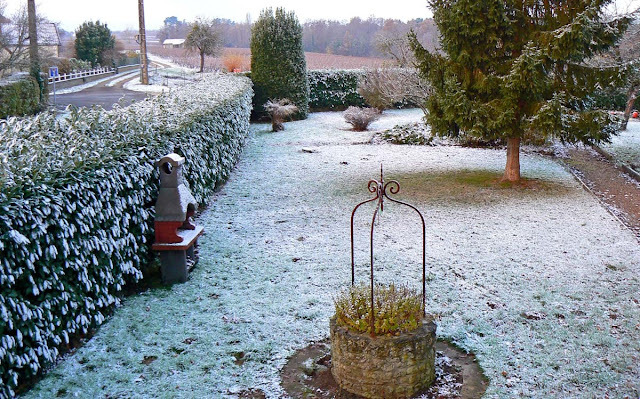 We'll pick up the bird on Christmas Eve in Montrichard, a town about twenty minutes from us. That's where the poultry vendor will be on Christmas Eve. Not in our town. You do have to figure out where the vendors will be on which day, especially when there will be holidays involved. In the shell. I'm sure she'd eat them already shelled, but that's not the way we get them around here. I don't remember exactly how it started. But it probably happened when one of us was cracking walnuts at the dining room table. Callie sat and begged. She got a (shelled) walnut to shut her up. Note to self: that never works. Callie finishes up with a walnut. She'll want another. Then a walnut in its shell probably fell on the floor and Callie went to work. She knew what was inside and deftly cracked the shell open and licked out the nut meat. She left the shell in pieces on the floor. Soon after that, she began to sit and beg for walnuts each time one of us cracked some. In no time she learned that we kept them in a bowl on the table. I caught her more than once with forepaws on the tabletop, looking longingly at the bowl of walnuts. After a sharp "No!" she would get down. But then she'd get a walnut rolled across the floor. Now she stands and whimpers under the buffet where the bowl of walnuts sits. Every day. I try to resist, but I can't. 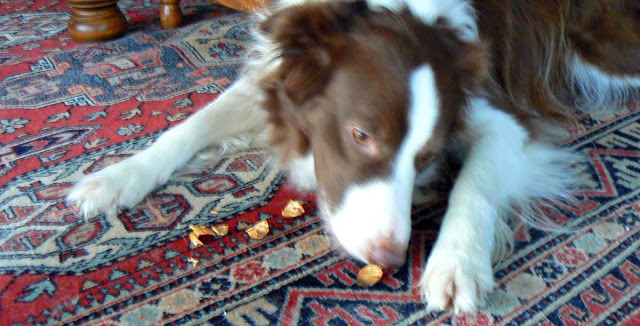 I roll a walnut along the floor, Callie chases it down and cracks it open. She gobbles down the nut and leaves the shells on the floor. For now she's getting the tiny nuts we collected this fall from under the tree in the vineyard. Callie began to stop under that tree during every walk and eat one or two fallen walnuts while either Ken or I was busy stuffing our pockets. She always cracked them open and left the shells behind. But while she's slowly eating up the nuts we collected, we're not without walnuts for cooking; a friend of ours who has a walnut tree in her yard gave us a good supply of nice big walnuts and we are still using them. I don't know what we're going to do when we run out of walnuts. I refuse to buy walnuts for the dog. I simply refuse. Stop that snickering, Callie. 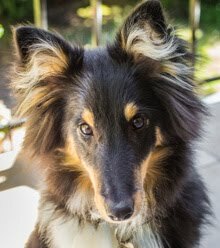 I just did some internet research and found a lot of sites that say walnuts, especially shells that have gotten wet and grow mold, are poisonous to dogs. They cause all kinds of gastrointestinal problems that lead to vomiting, excessive drooling, and loss of appetite. Callie has shown none of these symptoms. She's not vomited and she eats very healthily. And she's been eating walnuts (sans shells) for months. But still, apparently there's a lot of phosphorous in walnuts that can lead to kidney stones. You know, it's just like with humans. Everything is bad for you. Every week some study is misrepresented in the news, and many people (especially now with the internet) can get all panicky and go overboard with things, magnifying the risks of anything and everything until they're afraid to step out their front doors. Dogs have been around for a long time. And so have walnut trees. And, I dare say, dogs and walnut trees have coexisted without great harm to either for thousands of years. 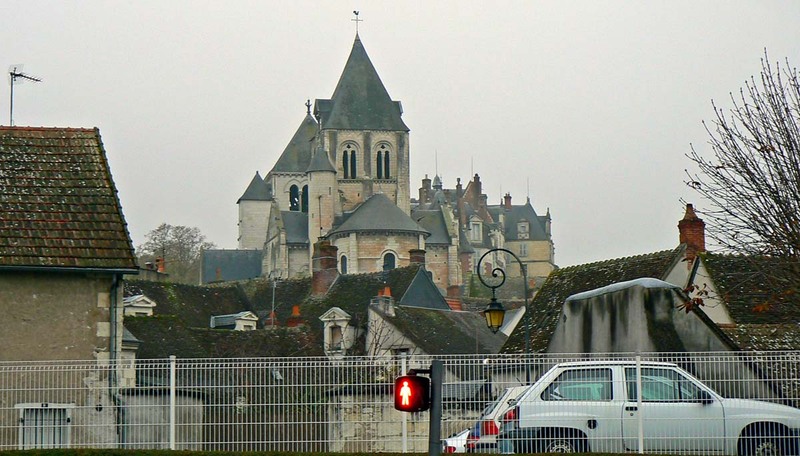 The town across the river from us is called Noyers-sur-Cher, which means "Walnut-trees-on-the-Cher." And there are plenty of healthy dogs over there. So, I'm not going to worry too much. But I'm also going to stop giving walnuts to Callie. There aren't many left anyway, as I said. I'll give her a doggy treat instead. This isn't going to be easy for either of us. We've been shut-ins for a while. Until yesterday, that is, when we got in the car and drove up to Blois to go shopping. The big E. Leclerc hypermarket had some holiday promotions and I saw a thing or two in their catalog that I wanted to get. And we also wanted to stop by the Asian grocer which is just down the road. 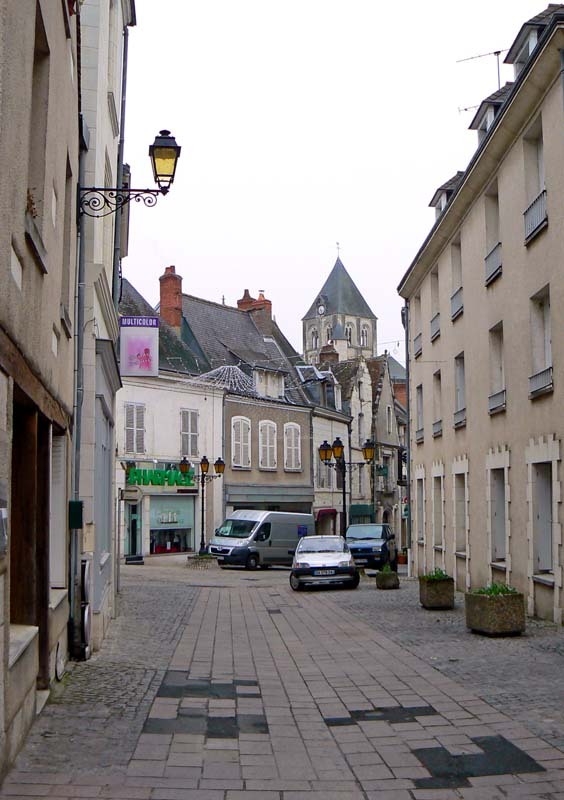 Blois is a forty-five minute drive from St.-Aignan. 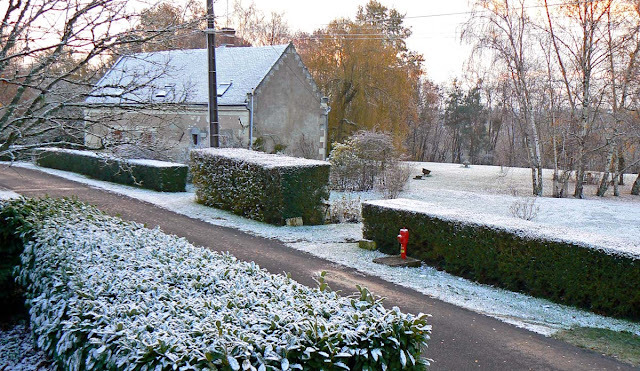 A view of central St.-Aignan, before the recent snowfall. The shopping went fine; it was not a zoo. We didn't find everything we wanted, but we picked up a few more grocery items than planned so the trip was worthwhile. And the drive was pleasant in that the sky cleared along the way. The sun made everything look nice and gave us a good dose of whatever it is the sun gives you. Of course, neither of us thought to take our cameras, so we have no photos to share. Many of you know that I keep records of our daily temperatures and rainfall amounts in a spreadsheet. I've done it since early 2005. 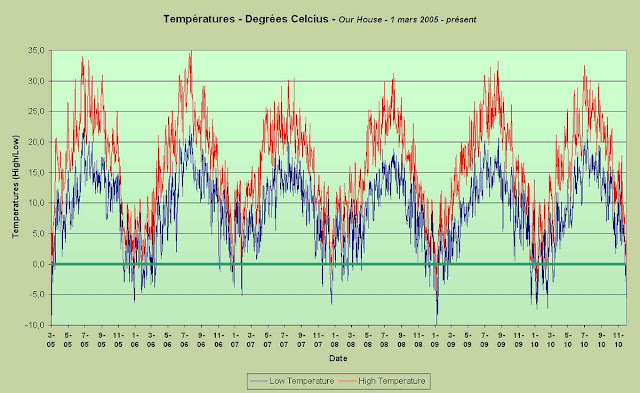 I wish I could say I have a fancy weather station on top of the house linked to the computer to automatically collect the data, but I do it the old fashioned way. I have a little form printed out and I write the daily high and low in the form. 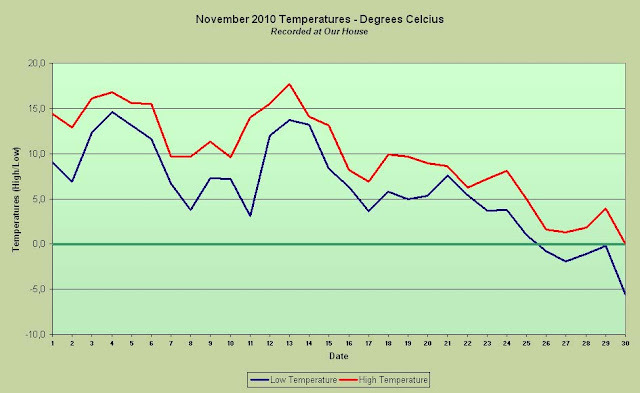 Temperatures at our house for November 2010. The thermometer is radio-controlled with an outdoor unit that's hanging on the north side of the house, under shelter and shaded. I have a plastic rain gauge in the back yard that I have to remember to look at after each rain, and empty. The daily recordings are habits now and I rarely forget to do them. Six years worth of highs and lows. Click to encelciate. These charts are made from the spreadsheet program. The top one shows how our temperatures dropped somewhat dramatically during the month of November. We spent the first half of the month enjoying highs around 15ºC (the high 50sF). The second half of the month we watched (and felt) the temperatures fall steadily to zero (freezing) and below. 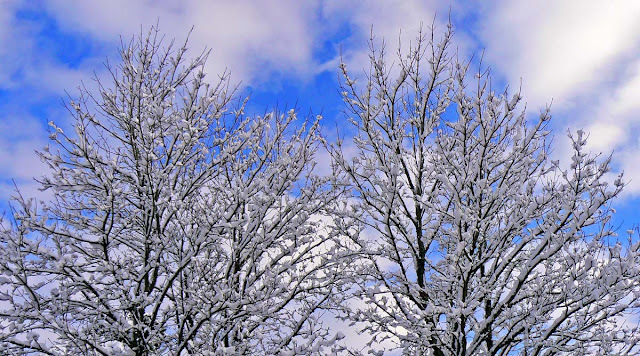 The snowstorm we had occurred on Sunday the twenty-eighth. 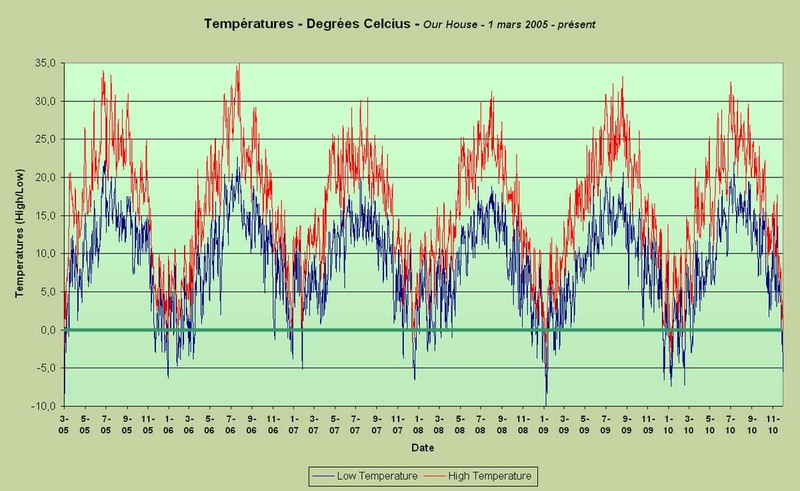 The bottom chart shows all the temperatures I've recorded since March 2005. Isn't retirement fun? You've likely seen this shot a hundred times. It's out the guest room window, looking west over the vineyards, at sunset. But you may not have ever seen it with snow on the ground. 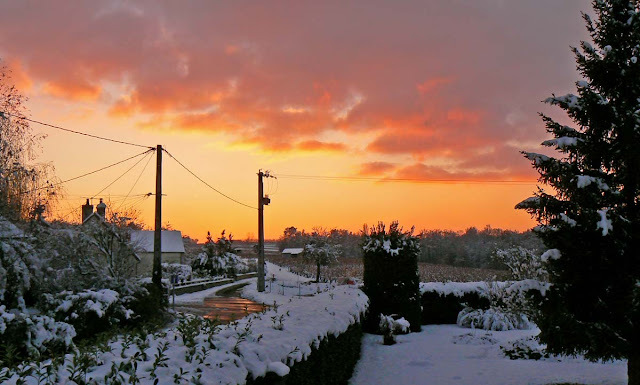 The sunset on 29 November 2010, about 5:00pm. This snowfall is history. Tuesday morning's walk in the vineyard felt very France-like. Bare trees. Many browns and somber colors all around. Leaden sky and a light rain falling. The bright spot in this season is that the grass is vibrant green. Our grass doesn't go brown in winter. Sometimes the grass begins to turn brown in a hot, dry summer, but it never goes completely brown. But in winter, our yards and the rows between the vines in the vineyard are as green as a Saint Patrick's Day parade. It helps with the mood. Get it? Snow? Post? It rained steadily for over twenty-four hours and most of the snow is gone. But there are still some bits here and there hanging on. The winter wonderland has been replaced by a muddy metropolis. Well, ok, it's not a metropolis. But it is muddy. This was taken a week ago when the snow was fresh. Our next taste of winter should come on Wednesday and Thursday when temperatures are predicted to head south again. And with all this water on the ground, it will be interesting. We'll see. It's a good thing that Ken went to the store for some staple items on Monday. The snow melt is revealing all the fallen leaves that we didn't get up off the ground. When it started raining, the leaves were still on the trees. As they fell, they were wet and we thought we'd give them a chance to dry before raking them up. Then it snowed. I'm hopeful that they'll have a chance to dry out again before they decompose. Our red maples. The leaves are all still on the ground. They never got dry enough to rake. These are the two maple trees in our front yard directly opposite the kitchen window. In summer, when they're leafed out, they shade the front of the house until mid-morning. We get nice dappled sunlight through the eastern windows. In winter, the sun (when it's visible) can beam right into the kitchen and living room through the bare branches. 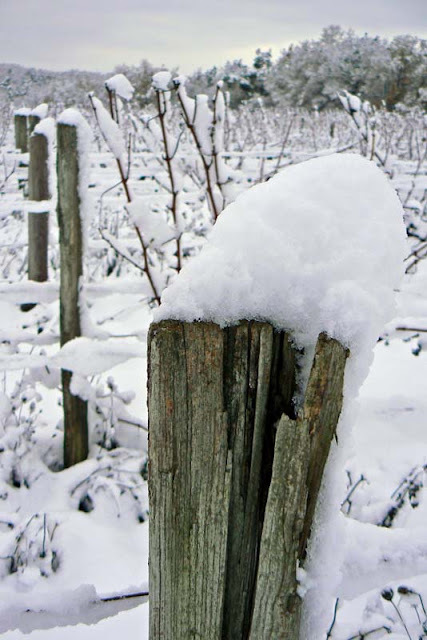 The rains began on Sunday and the snow is washing away. The weather people say the thaw is temporary. Of course it is... it's only December 6! Winter hasn't even begun yet. This has the makings of a long, cold season. After a snowfall is when I realize just how much wildlife there is out in the vineyard. While I might be making the first boot prints in the freshly fallen snow, mine are by no means the first foot prints. Of all the tracks I see, I'd have to say that the lièvre (wild hare) tracks are the most plentiful. Their unmistakable pattern of prints criss-crosses the vineyard road pretty much everywhere. The passage of a wild hare is marked by these footprints. There are many chevreuil (roe deer) tracks as well, but they normally are fewer and farther between, usually going in one direction without much diversion. And now I know renard (fox) tracks are among those I see, since on Friday morning a fox crossed our path during the walk. Callie chased it into the woods. These could be pheasant tracks. Or, they could be much less glamorous pigeon tracks. There are also bird tracks. 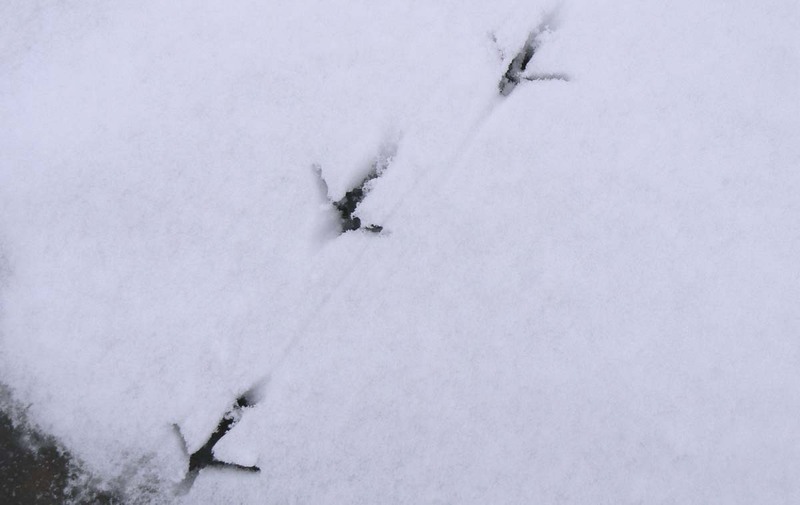 I suspect these above belong to un faisan (a pheasant), but I'm not certain. Callie will flush pairs of pheasants from their hiding places under the vines every once in a while. The male will take off in one direction with dog following it. Then the female will fly off in the opposite direction. Pretty clever, those pheasants. I don't mean to bore you, but this is what it looks like around here right now. And, with the exception of walks with the dog, we are not venturing out. Our house is at the top of a rather steep hill and I don't like the idea of taking the car down or back up it when there is ice and snow. The road is cleared now and again, and much of the time it just looks wet. Tuesday's, Thursday's, and Friday's regular bread deliveries came without incident. But the bread lady told us she's not delivering today. And guess what? Turns out it's clear and dry. The dirt road through the vineyard. I was obviously not the first one out with a dog. Still, the temperatures haven't gone above freezing, so you never know when you might encounter a patch of verglas (black ice). We have all the food we need in the house, thanks to a well-stocked pantry and a good chest freezer. We have frozen baguettes for the days when bread is not normally delivered. And Ken's made cornbread and biscuits, too. The prognosticators say the thaw will come on Sunday. Even if it does, my snow photos will go on for a bit. Equal time for cats. This week, as the temperature plunged below zero outdoors, Bertie's home in the utility room got a little chilly. So we've been taking advantage of Callie's nap times to bring Bert upstairs into the house. He likes to snooze by the wood stove in the evening. Miaou (that's "meow" in French), toasty warm. 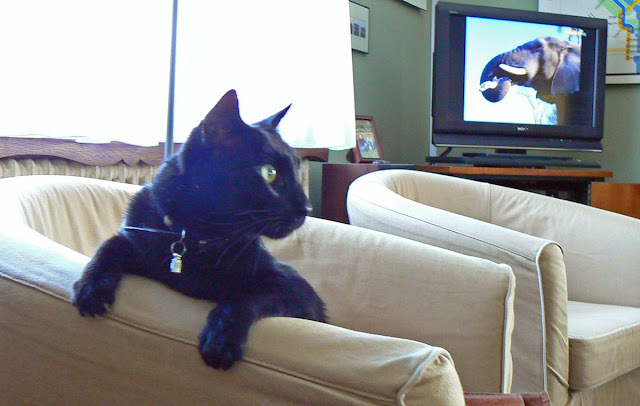 On one afternoon I was watching nature programming on television. Bertie was in the chair closest to the fireplace. He was up on the arm of the chair to get some of the heat from the fire. Of course, I had to grab the camera because he looked so cute. The shot with the elephant cracks me up. I watched a movie downstairs on Tuesday night while Ken and Callie were upstairs. Bertie spent most of the time on my lap. Then he started getting curious and ventured into the kitchen. In a snap he was up on the counter and down into the sink. After that he was back down in his room. In the snow! Callie loves the snow. Or at least she doesn't hate it. It's a curiosity for her. On our first snow walk this year, the snow was wet and heavy. I made snowballs to toss to her. 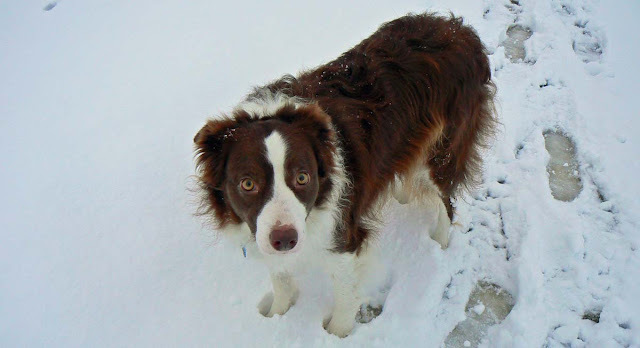 When she missed them, they disappeared into the snow on the ground and she tried in vain to find them again. That was fun. For about five minutes. Out by the end of the dirt road. My favorite part of snow walks, and I think I've mentioned this before, is that Callie is clean when she gets home. No mud or dirt. Just little snowballs clinging to her fur. I pick them off and she eats them. More fun! When this snow starts to melt and the mud returns, we'll be back to our post-walk shower routine. The days are shorter and shorter as we move toward the solstice. But we have holiday traditions to look forward to that will get us through. All of them involve food. On the solstice we have steak au poivre in a cognac cream sauce with french fries. Christmas Eve brings our annual fondue savoyarde (cheese fondue). On New Year's Eve we'll eat huîtres (oysters) on the half shell. And on January 1 we'll ring in the new year with a pot of black-eyed peas. That last one is a Southern American tradition. My research shows that it originated as one of many food traditions of Sephardi Jews in the fourth and fifth centuries. They ate the plentiful and nutritious bean on New Year's Day for luck and prosperity. Migrating Jews took the tradition with them to the American south in the early eighteenth century and it spread. Roses are red-ish, violets are blue-ish. If it wasn't for Christmas, we'd all be Jewish. We're having a cold wave. Tuesday morning's low was -5.6ºC (about 22ºF), and that's pretty cold for these parts. Other regions nearby got down to minus thirteen (single digits F), so we were lucky. The forecasters are predicting even colder temperatures as the week goes on. A few birds headin' out over the snowy vineyard on Monday. We're fortunate that our power returned within a few hours after the snow storm and that we can run the boiler. The house would be mighty cold if we had to rely on the wood stove alone. We did that back in early March; it was fine, but not fun. And electricity is not overrated. It keeps us in touch with the outside world. Tuesday morning's temperatures in France and nearby countries. Apparently much of northern Europe in is the chill zone. The only thing really unusual here is the timing. This weather is more fit for January or February. This cold, this early, is newsworthy. The map above shows our Tuesday morning temperatures. We live where you see that hot pink dot in the middle of France. Sunday's snow storm was quite an exciting event for us. We don't often see this much snow at once. Those of you who live in real winter climates won't think this is very much snow at all. What we got was wet and heavy and the shrubs and trees are bending (and in some cases, breaking) under the weight. Our little hamlet and the Cher River valley beyond. The snow lasted until after dark, but I think it tapered off pretty quickly. Around six pm, our lights flickered and went out. I lit up some candles and threw another couple of logs on the fire. We ate a hot bowl of soup (thank goodness for gas stoves) and sat around for a while before calling it a night. The power came back on before midnight, so the contents of our freezers were safe and we had a full tank of hot water in the morning. Another view from farther out among the vines. The sight was beautiful on Monday morning when I went out to walk with Callie. There was no wind, so it wasn't too cold and the snow hadn't blown out of the trees. I took a lot of photos, mostly of the same old stuff. They'll serve to jog our memories in future years when we reminisce about the Thanksgiving weekend storm of 2010. Now you know you will be seeing snow photos for the next few days. This is an iron, or steel, I don't know, gate on one of the little streets in the center of Saint-Aignan. I can see that there is a courtyard and entry to someone's house. 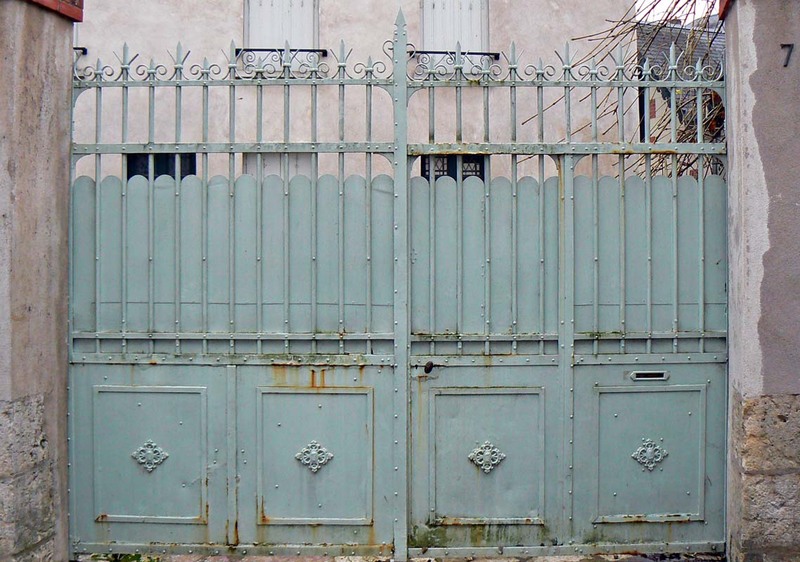 Since I've not seen the gate open, I have no idea whether it hides a lush garden, a stone-paved courtyard, a parking space and car, or a huge pile of debris. One never knows. Sunday started out like any normal day, but it got very strange. It started snowing in mid-morning. A few flurries, a curiosity. Then, by about eleven, it started snowing big flakes and began to accumulate. By three o'clock we had at least four inches on the ground and the snow was still coming down. I de-wormed the animals, too. That was just a matter of giving each of them a little pill. Callie's pill was bigger than Bertie's, so I chopped it up and mixed it with her lunch. She normally doesn't like pills. The worm medicine became available in a chewable form for dogs abour a year ago, and Callie really liked that last time. But the receptionist at the vet's office said she stopped ordering it because nobody seemed to like it. I told her I did, because Callie liked the chewable. So maybe she'll order some more now. I followed the doctor's advice and enrobed Bertie's pill in butter. He ate it up without any problem. I also brought him upstairs for a while on Sunday after lunch. He was ok, but it was clear he just wanted to go back down to the utility room. I figure, whatever the cat wants is ok with me. But I want him to know he can hang out in the warm house as opposed to the less warm utility room if he wants to. 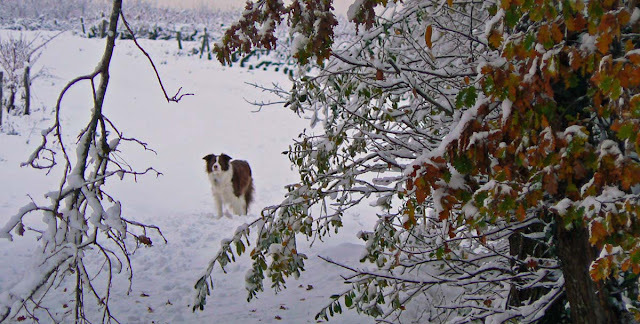 I wrote most of this post on Sunday, while snow was falling. It's now 7:30 am and I'm waiting for light to take Callie out. I'll take the camera out, too, and maybe I'll get some snowy photos for tomorrow. It seems like winter has set in. But it's still November and, officially, winter is still a good three weeks away. Well, the solstice is. I'm wondering, as we all must, what this early chill and snowfall mean. A long hard winter? Or an early spring? Only waiting will reveal that. The field at the foot of our road on Saturday morning. Behind those trees is the Cher River. In the meantime, we are in our winter pattern. Days inside (except for walks with the dog). Afternoon and evening fires in the wood stove (and that means cleaning out the ashes every morning, chopping up a few logs, and lugging them up the stairs from woodpile). Lunches of hearty, stick-to-your-ribs kinds of foods (yesterday was macaroni and cheese, today is blanquette de dinde). We still hold out hope that we'll have some sunny dry weather before the end of December in which to get a little more done in the yard. There are still all those leaves on the ground to deal with. It's unusual to have snow this early where we live. We didn't have a lot, but it stuck overnight and we woke up on Friday to these pretty sights. The view from our kitchen window, looking easterly. The temperatures have fallen to freezing, obviously. But they're not climbing much. We're just hovering at zero for the next few days. There are no more predictions for snow for the moment. The view from the guest room window, looking westerly. Most of our snow, when we get it, comes in January or February. I think the biggest single accumulation we've seen in the seven and a half years we've lived here was about five or six inches. And that was exceptional. We'll see how the rest of the year goes. Bertie's vet visit on Friday was good. He was a very good cat and just sat on the vet's table and let himself be caressed (the vet is very gentle with animals) and then didn't even flinch when he got his vaccination. We got a confirmation of the worm diagnosis, so we're administering de-worming pills this weekend (to Callie as well, for good measure). As far as his behavior goes, the vet said he sounded like a normal cat. No worries. If the neighbors don't like him, he said, they shouldn't pet him or otherwise encourage him. We live in the country and there are cats around, just like there are birds, badgers, and hedgehogs. Once they work out their territorial issues with the neighboring cats, and they usually do, there shouldn't be any more conflicts (and there are very few cat/cat problems now with Bertie). We think this particular neighbor is just difficult. Everyone around us seems to confirm that. She's going to complain, no matter what. It's in her nature. Ken and I both feel much better about Bertie and how he's doing. Thanksgiving day was a success! We were six at the table. Our steamed Moroccan lamb was delicious. I took some photos, but they're not very interesting (or technically worthy), so I will spare you. 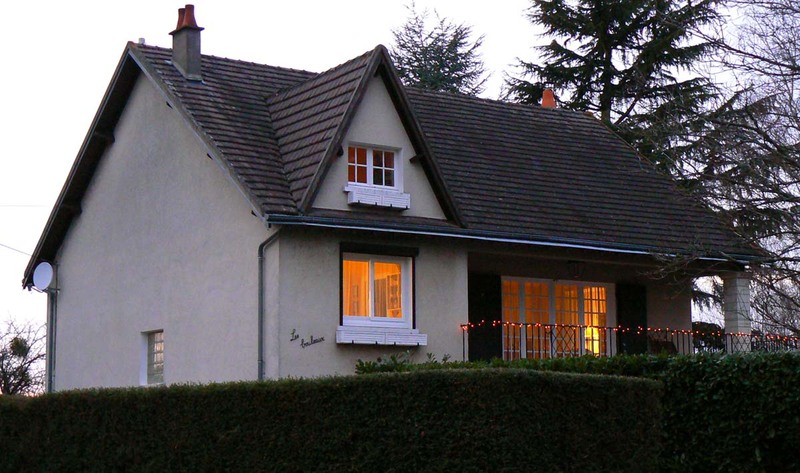 Instead, another photo from Saint-Aignan. 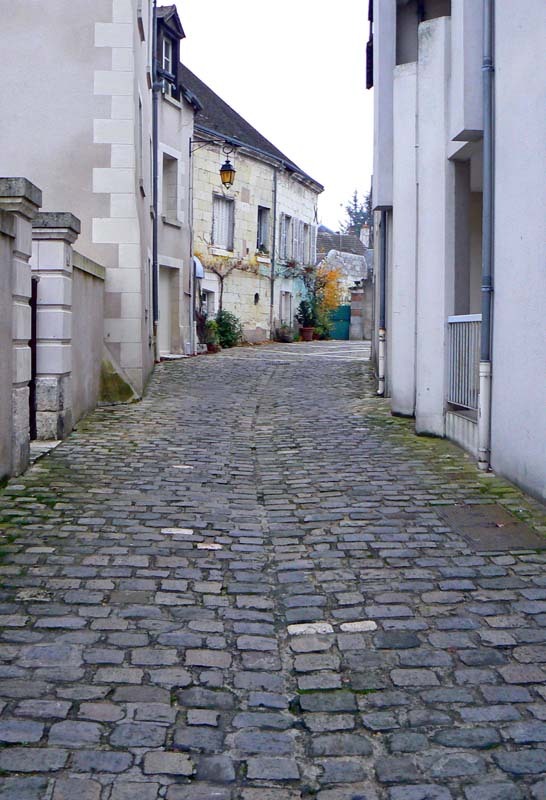 Another cobbled street in Saint-Aignan. Today we are taking Bertie to the vet to update his shots and to get some de-worming meds. His recent illness might be related to worms, or so the vet said. We're hopeful that it will be that simple. He came up to see the Thanksgiving guests for a few minutes yesterday. But with two dogs in the house, his cameo was brief. Then last night, while Callie was resting in the den, I took Bertie up to the loft space and he sat on my legs while we watched tv for about an hour. I could tell he was enjoying being in the house and hanging out with us. Once Callie came upstairs we had to take Bert back down to his room. But I think we're making some progress. 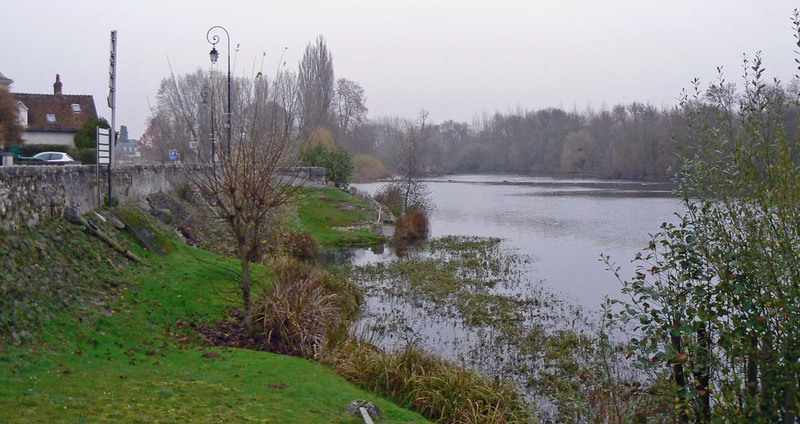 The part of Saint-Aignan that's closest to the river is, of course, the oldest part of town. There are some buildings remaining from the medieval days, but they're just a handful. I think most of the current buildings date from the nineteenth century. The streets of town have been paved and re-paved over the centuries. Since we've been here, we've noticed the town installing more and more cobblestones in the old-fashioned style. Just this past summer, you may recall, St.-Aignan's central place was re-paved with fresh cobbles (here's a link to my post about it). Right now it looks a little too new. I think there were issues with the way the work was done and how the stones were sealed. Some friends told us that the town may scrape or otherwise remove whatever sealant they used. Not sure how that will work out. In this photo, the cobbles are not new and have been in place since before we arrived. The pattern looks like something from the seventies or eighties, but I really don't know when this was done. This is a residential section of town between the river and the central place. The river looks sleepy this time of year. It's moderately full, but still slow-moving. At Saint-Aignan it splits around an island; the northern branch flows over a spillway and the southern branch is dammed to make a small reservoir for a mill that used to stand on the bridge. The mill is long gone. The Cher at St.-Aignan, looking downriver. The spillway is just visible on the upper right. I took this picture at the foot of the rue Maurice Berteaux which runs along what was, in medieval times, a large drainage ditch around the town. This is the point at which the ditch emptied into the river. And I'm sure the storm drains that replaced the ditch when the road was built still empty into the river at this spot. You can kind of see where that happens under the stone wall on the left side. I had my semi-annual checkup on Monday. All went well. My blood work was fine, all markers good if not a little higher than last time. But he said there was no cause for concern. I lost two pounds since my last visit in June. He wants me to cut back on "le bon vin de Touraine." The good wine of our region. So, if I take him literally, I can increase my intake of wine from Bordeaux, Burgundy, or Champagne, as long as I cut back on the local stuff. Yeah, right. The sign tells me not to walk, so I didn't. This photo is of the church and château in Saint-Aignan. My car is parked in this lot because I needed to stop at the blood lab to get my results before I headed to the doctor's office. They send him the results separately, but I had to go and get my copy and pay my fee. I had some time in between so I walked around town a little and took some pictures. It's cold, not above 40ºF, and it's overcast and spitting rain. It is November, after all. Leeks were on sale. Seventy-five euro cents a kilo, or about fifty American cents a pound. I used some on Sunday to make leek and bacon pizzas. First steps: cook some smokey bacon until almost done and cook some cleaned and chopped leeks in a little olive oil, white wine, salt, and pepper. Chopped leeks sauteing in olive oil and white wine. I added few red pepper flakes, too. I made the pizza crust on Saturday night and it rose overnight in the refrigerator. 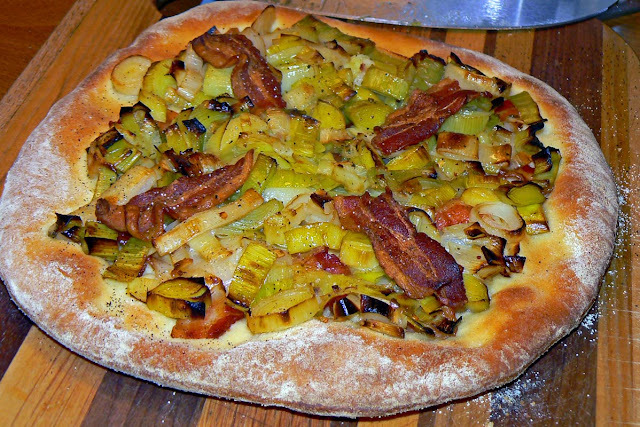 Then I rolled it out, topped it with some of the bacon and the leeks, and put it on a pizza stone in a 275ºC (525ºF) oven. There's no cheese, but I think a little parmesan might be good on these. I made two pizzas, as usual, and they made a great lunch. A finished pizza ready to slice and eat! The little decorative strips of bacon are optional. I used two rather large leeks (the green tops removed and frozen for soup stock later) to make two pizzas. I also used ten strips of smokey bacon (a package of 140 grams) that I baked in the oven at 150ºC (300ºF) until almost done. I find that baking bacon is much easier and neater than frying it in a pan on top of the stove. Normally I would use the smokey bacon chunks called lardons, but we had these strips on hand so I used them.